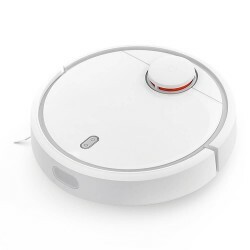 Based on the accurate distance information obtained by the laser ranging sensor and the omnidirectional data such as the gyro direction data, Xiaomi robot vacuum cleaner uses its impressive simultaneous localization and mapping (SLAM) algorithm to map the optimal cleaning path around a room avoiding, obstacles, and hazards such as stairs. Odometer data and accelerometer data, which can be used to construct the room map in real time, so as to provide the guarantee for the comprehensive path planning. A Laser distance sensor of the Xiaomi robot vacuum cleaner scans the surroundings of the robot at up to 1800 times per second mapping out a 360-degree picture of the interior of your home. It combined with 12 types of other sensors such as the ultrasonic radar sensor, cliff sensor, gyroscope, and accelerometer, in any home environment, 9.6cm fuselage height can easily enter the corners of the home, visible and invisible places can be elegant finish sweeping. For smoother cleaning, the robot utilizes powerful NIDEC brushless motor which delivers up to 1800Pa air pressure. The main hover brush automatically adjusts the height to create a tight seal with the floor for thorough dirt pick-up on uneven surfaces. It can reach the maximum air volume of 0.67m3/min, the maximum wind pressure of about 1800pa*. Xiaomi robot vacuum cleaner comes with a 5200mAh (14.4V / 74.88Wh) lithium ion battery which delivers a cleaning time of around two hours, after which the unit will automatically return to its charging dock to recharge. The vacuum remembers its last location, so even if the battery runs out in the middle of a cycle, the unit will recharge itself and come back to the same spot to re-commence cleaning. The robot also syncs with the Mijia APP, allowing you to switch on and remotely control the device, you can check the sweep status in real time and get a real-time map of the cleanup. In addition, you can always arrange it&apos;s cleaning modes and set automatic schedules. Three separate processors simulate the way of the human brain thinks and collaborate with each other, to track its real-time movements, calculate the location and determine the best cleaning routes, making the sweep more efficient. The robot will start cleaning with Edge cleaning mode and Zigzag cleaning mode. Xiaomi robot vacuum cleaner will back to the charging dock and recharge automatically after finishing cleaning. When the power is less than 20%, it will recharge to 80% and get on with the unfinished work. Coming with elegant white appearance, the robot adopts high-strength ABS material with IMR processing, wear-resistant, and anti-corrosion.